Hello there, today is the day! The new Clearly Besotted products release tonight at 10pm. I have two final teasers to share with you today. 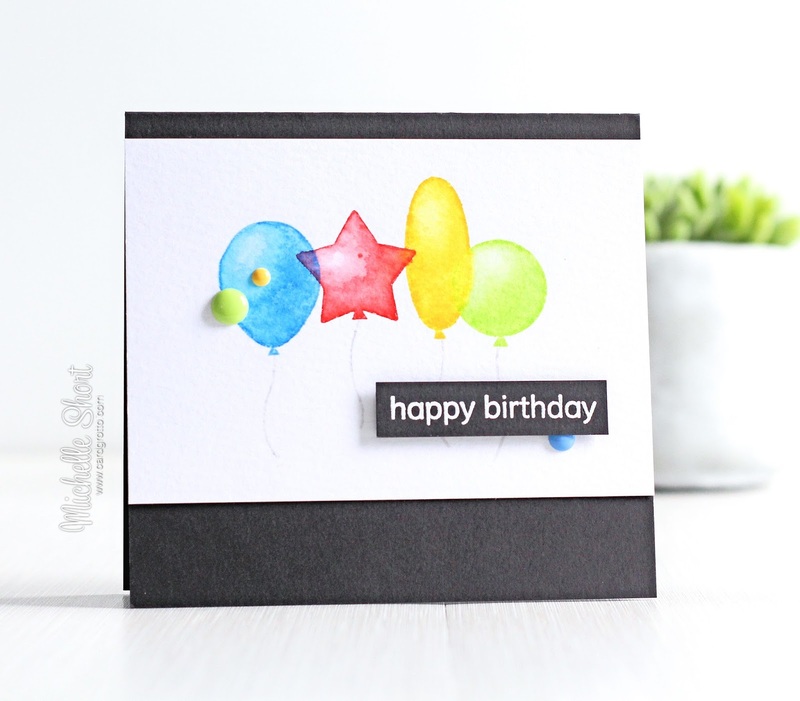 My first teaser uses the new Let's Party stamp set. 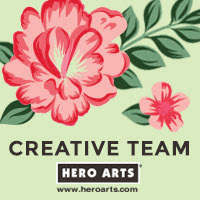 It is great for Birthday cards. 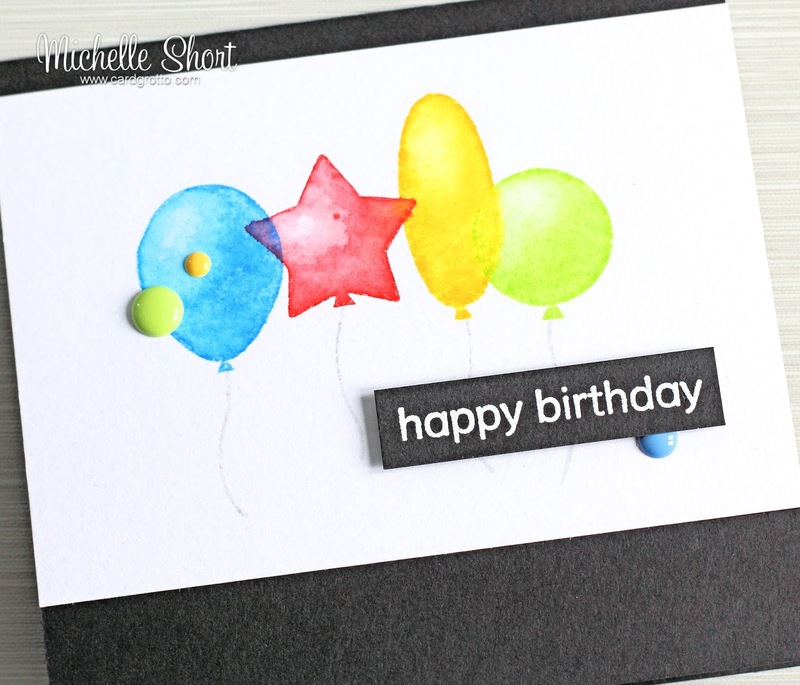 I started off by taking apiece of TH Watercolour cardstock, I stamped the balloons on to it using TH Distress Inks. I made sure to add more ink to the sides of the image and less in the middle. Once stamped, I went over the image with a paintbrush and water to blend over the colour. I let the inks dry before moving on tot he next balloon. For the strings, I stamped the ink off once on to scrap paper and then stamped on to the panel, for a lighter colour. I then blended over with the paintbrush again. The sentiment, from the A Little Sentimental set, was stamped on to black cardstock with Versamark and heat embossed in white. The panel was adhered to a black card base with ATG. The sentiment strip was then added with foam tape. To finish off, I added a few enamel dots. 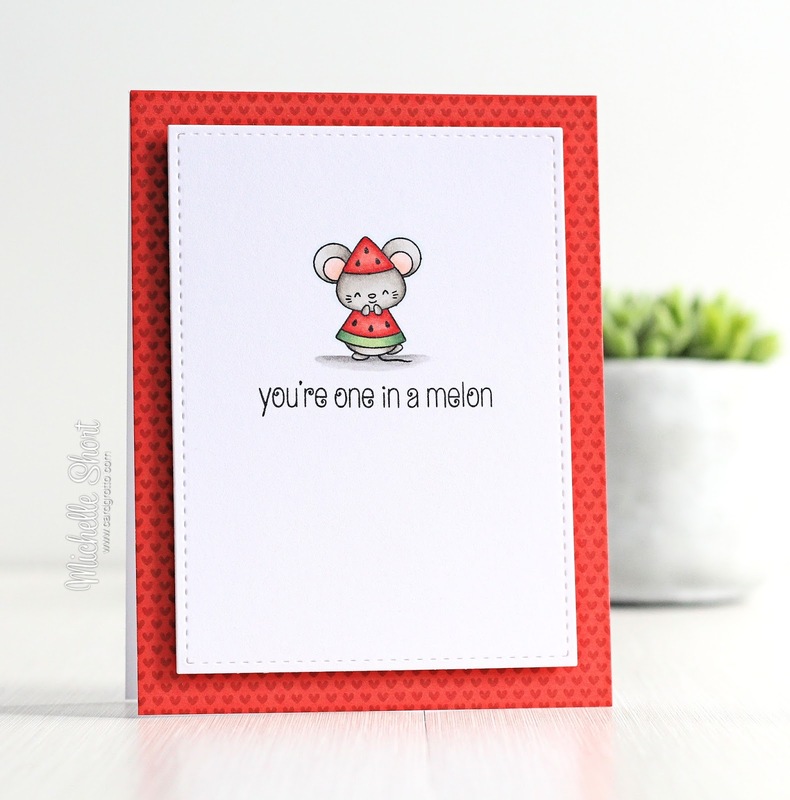 My second teaser uses the new adorable Feeling Fruity stamp set. Oh my goodness, how cute are these little mice! They are all dressed up as fruit! So fun. 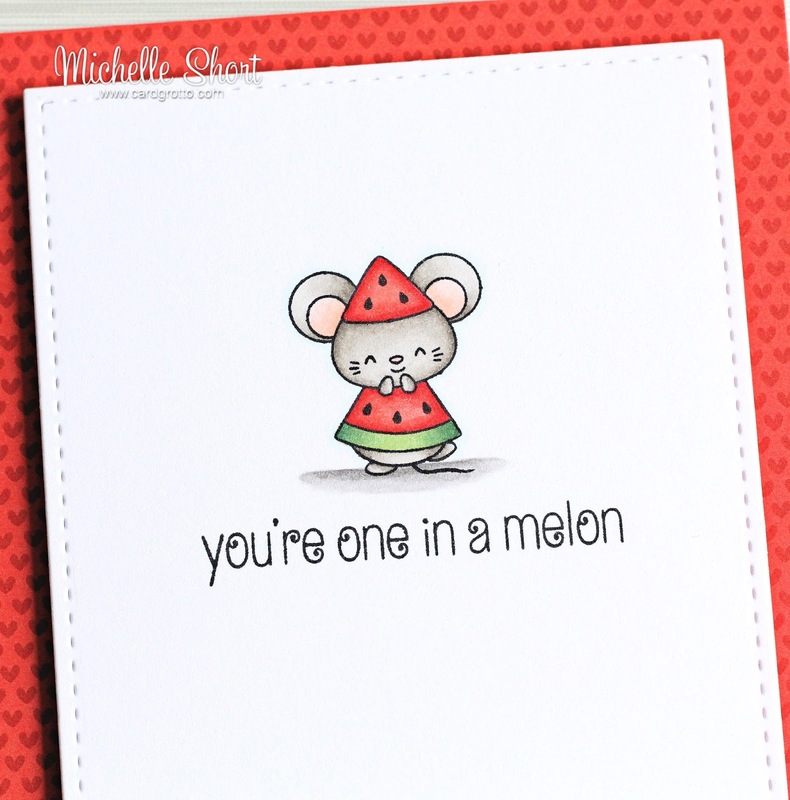 For my card, I took a panel of white cardstock (cut using the ME Femme Frames die) and stamped the little mouse dressed as the watermelon on to it. The sentiment, from the same set, was stamped below. The little mouse was then coloured using Copoic Markers. The panel was adhered to an A2 white card base that has a panel of paper from the Doodlebug Santa Express paper pad on the front, with foam sheet. To finish off, I added clear Wink of Stella to the watermelon part. COPIC MARKERS: Mouse - W6, W5, W3, W1, R12, R00, R000. Watermelon - G28, G46, G43, R29, R27, R24, R22. Ground - T5, T3, T1. I really hope you have enjoyed looking at my teaser cards this month. 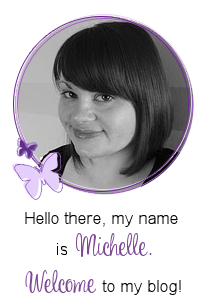 I will be back later with my release video but in the mean time, please go and see the release reveal over at Stephanie's Blog. She will also be sharing links to the rest of the DT and Guest DT sharing today too. See you later. These are great cards Michelle. I really love how you did the balloons. They look so amazing. The mouse is very, very cute! I love the stamping technique you've used on the first card.